The secret is out. Brands are spending a larger chunk of advertising dollars on Experiential Marketing. **In walks experiential marketing. ** LIVE, touchable, participatory, real-time marketing. Comparing traditional outputs to experiential marketing is like comparing a sitcom on the TV screen to a LIVE set at the comedy club. Or a dramatic flick at the Cinema to a dramatic story LIVE on the Broadway stage. Both have beauty. But there’s just something powerful and sticky about consuming and participating in a LIVE event. Leading brands are finding more ways to create these real life moments with their audiences, moving Experiential Marketing from an incremental spend to a core staple. Let’s take a look at a few examples of brands that are taking these engaging activations to the next level. A recent campaign from Brooks Brothers showed exactly how brands can bridge the gap between experiences and digital technology. The goal was to show the exciting changes the brand has made in recent years to stay on the cutting edge. Brooks Brothers’ polo pop-up experience allowed audiences to check out the latest collection of supima cotton shirts, feel the quality of the product, enjoy drinks and music and order the product directly through the experience. This unique setup allowed customers to place an order on the spot and have the shirts delivered to their door just a few days later–A sweet combination of full-blown customer service plus the flexibility of reaching audiences where they are. The smooth as supima experience showed just how contemporary the Brooks Brothers brand has remained. It was NYC Fashion week. The Coach team was looking for inventive ways to show off their new collection with Selena Gomez. With the help of Vector Media, Coach transformed a Digital Double Decker (DDD) into an on-location pop-up store. The DDD functioned as an extension of the 5th Avenue flagship store while crowds flocked around to take a look inside and soak up the energetic atmosphere that typical retail environments struggle to create. The activation was a hit. But Coach and their media partner, Vector, went a few levels deeper, building the activation into a larger 4-week outdoor media push in key markets nationwide. The successful activation provided an anchor for a much larger campaign with significant shelf life. At the same time, Selena interacted with fans directly, taking photos and creating massive social media buzz via multiple digital channels. The digital success helped further push the campaign to another level. Thinking of combining relationship-building activations with transactional promotions? Vector helped TOUS think outside of the proverbial jewelry box with “Your Grand Tous Day.” The luxury jewelry brand celebrated their shoppers with a weekend of discounted products in stores and online. But the digital world is a busy one, so TOUS took to the streets with a party on wheels. 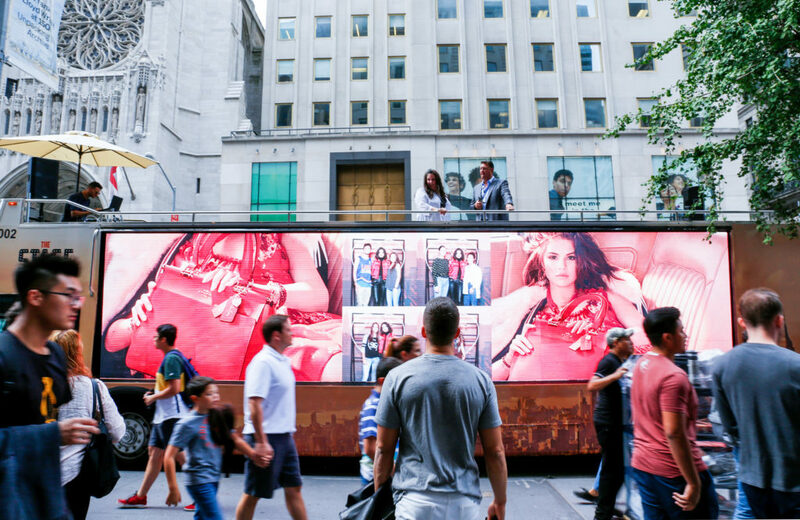 With the TOUS Digital Double Decker, TOUS was able to bring the party (and promotion) to Rockefeller Center, Soho and the Financial District with live entertainment and free tote bags for #touslovers. The campaign was a perfect example of using experiential activations to rise above the noise, strengthening an already great sales-generating promotion. In the current “ads-everywhere” landscape, experiences will continue to differentiate up-and-coming brands. The brands that are able to combine high-impact activations with thoughtful cross-channel plans will be a step ahead, particularly with younger audiences. Reach out to our experiential team, we can’t wait to plan your next brand experience.